As the established GM twin turbo V6 tuning experts, TRIFECTA is pleased to announce the immediate availability of the TRIFECTA calibration for your 2016--2019 Cadillac ATS-V! With roughly 20 minutes to spare, you can reprogram your Cadillac ATS-V to drive and perform even better than it did from the factory. Without changing a single piece of hardware, you can bring your 464HP sport sedan or coupe up to 600HP** (380HP up to 500HP as measured at the wheels on a chassis dyno), and give it a more sport-inspired drive feel. If you have a 2017 or newer Cadillac ATS-V with an automatic transmission, you do NOT have to remove your transmission control module (“TCM”, T87A) for any unlocking process. 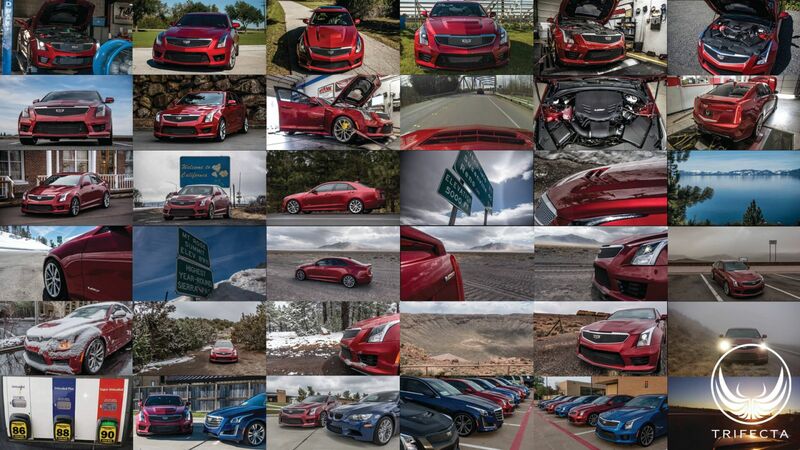 All TRIFECTA Cadillac ATS-V calibrations include extensive transmission strategy reworking. Why buy a tune from a dyno shop that might run your car on the rollers 10 times when you can buy from a company that's channeled over several hundred dyno pulls' worth of testing into their product? Rather than relying on a “dyno tuner” that may or may not have experience tuning the ATS-V (but almost certainly to their local area only), with TRIFECTA you can rest assured you're purchasing from the company that's been in the GM factory turbo vehicle tuning business longer than anybody else, in many cases pioneering the tuning aftermarket for these vehicles. The TRIFECTA ATS-V calibration has been subjected to over 300 chassis dyno pulls, on dynos across multiple continents, and tens of thousands of test miles have been accumulated in virtually every climate, elevation and season. TRIFECTA's calibration for the Cadillac ATS-V is also packed full of exclusive and innovative features to make your ATS-V experience even better. From reworked knock control logic and zoning, to active fuel rail pressure management, to adding full-boost launch control, TRIFECTA's engineering team delivers exclusive features that Cadillac didn't even consider. **traction limited by factory tire and pavement condition (generally dry, medium worn asphalt). Faster times achievable with R-compound tires on prepared surface. The ATS-V offers several different drive modes from the factory such as Tour, Sport, Track and Winter / Snow / Ice modes. TRIFECTA's custom operating system modifications allow us to optionally (but included by default) offer Tour mode which limits horsepower and torque output to levels very similar to the factory levels. This feature is very useful if the vehicle is driven by others who would prefer the vehicle to operate like it does from the factory. Drive modes can be changed on the fly, and as such, the driver may select any mode, at any time. General Motors, starting in the 2017 model year, began using a new transmission control module (“TCM”, called the T87A) for the 8 speed automatic transmission used in the Cadillac ATS-V. The T87A employs digitally signed programming segments to prevent transmission calibration reprogramming by parties other than General Motors. While there is an exploit to unlock the T87A to allow reprogramming by other parties, it requires physical access to the TCM (via removal from the vehicle), and an unlock procedure. However, TRIFECTA is pleased to announce this “hands-on” exploit is not needed for the TRIFECTA Cadillac ATS-V calibration product. Extensive transmission strategy reworking is accomplished without “unlocking” the T87A. Anybody who's tried to launch the automatic transmission Cadillac ATS-V has noticed it's near impossible to both hold the rear wheels from spinning and simultaneously build full boost at launch. TRIFECTA's Full-Boost Launch Control exclusive feature allows the application of the brake, and full accelerator to build up to 18psi of boost while keeping the tires from spinning. After releasing the brake, full power is instantly applied. While this is helpful for little more than a smoke show on the stock tires, with proper tires and track surface, much quicker launches can be achieved (this feature does not interfere with the factory launch control features, and these features continue to work as they did from the factory). Whether anybody wants to believe it, or not, “knock”, defined as noise detected by the knock sensors, is going to occur from time to time. Generally this occurs when there's a transient change in fuel quality, or operating conditions. While the factory's knock control constructs are advanced, they make certain assumptions about how, and in which direction to adjust knock factor when knock is detected. The factory knock control strategy on the Cadillac ATS-V uses one zone only, encompassing the entire RPM range, and engine load range. TRIFECTA's Cadillac ATS-V calibration utilizes six zones and allows for finer self-adjustment when dynamic timing adjustments are needed. Furthermore, TRIFECTA's enhanced knock control employs an “ongoing” strategy which retains learned knock factors even after the engine is shut down, and continues to use them the next time the engine is started. Bi-directional knock control allows the ECM to begin its knock adaptation in the middle of the timing adjustment map, rather than always assuming it's running “high octane” fuel and potentially exposing the engine to audible knock. Let's face it, Cadillac did a good job making the Cadillac ATS-V fun to drive from the factory. That didn't stop our drivability engineers from making it even better. In Sport and Track modes, accelerator pedal response is improved, while also refining tip-in response. Transmission downshifts are progressive, as opposed to the “all or none” strategy the factory generally goes with. Lower gears are held to a higher RPM, so a downshift is not needed if the driver decides at the last moment to chase down and humiliate a European Exotic. Tour mode and Winter / Snow / Ice modes retain stock pedal response and transmission shift patterns. TRIFECTA was one of the first companies to bring the concept of comprehensive remote tuning to the mass market. If you have aftermarket parts, talk to us about adapting our calibration to support them! This powertrain calibration includes a TRIFECTA powertrain calibration file specific to your vehicle and includes a flash loader device Advertised gains are quoted as 'up to' and may be less for a vehicle operated at altitudes higher than near sea level. Requests for raising of speed limiter require photographic evidence of speed rating on tire sidewall, submitted via Support Request. Advertised gains are quoted as 'up to' and may be less for a vehicle operated at altitudes higher than near sea level. Trifecta performance sold me a tune for my ATS-V before they officially launched and I'm very glad they did. This tune completely changes the characteristics of the car and makes it drive like it should from the factory. I've been tuned with them for over 15k miles with no issues other than swapping to a set of colder spark plugs. My car has beat countless other cars and is still somewhat of a sleeper with the quiet exhaust of the stock ATS-V.
My car has hit 0-60 (upgraded tires) in 3.3 seconds on the street and ran mid 11s in the 1/4 mile, it's an absolute monster. 500+whp from a reliable car that I daily drive is incredible! Additionally, Steven has been super responsive and a pleasure to talk with and work with, he's customized my tune and has added variable power by driving mode. My car is an 8 speed automatic so I do not have issues with varying power levels taking off from a standstill. As you progress through the driving modes, Tour > Sport > Track, the car changes how still the chassis is, how stiff the magnetic ride is, how tight the steering is etc. With it being a full racecar in track mode, so what we did is we adding power as I move up through the driving modes. It's really cool that they are able to alter the amount of power your car stiffens up! 10/10 would buy a tune again and look forward to having Trifecta Performance tuning all my vehicles! I've had my Trifecta Tune now for a couple months and I have to say that this tune is probably one of the best developed tunes I've had in a car ever. I'm always skeptical about a remote flash tune but the development and testing that Trifecta has put into this tune resulted in a very precise tune that reacts with the car as if it was from the factory. I'm getting just under 500WHP and 502WTQ and it's very smooth and progressive. I know exactly how much throttle to give it to get the desired output. If I drive normal the car behaves and reacts like it would stock. Put it in touring mode and it drives like a luxury sedan. If that's not enough the tuning they've done for the transmission on the 8L90, the fuel rail management, and the full boost launch modes make this car a beast. I hear many people talking down about canned tunes and then bragging how they got a custom tune with full exhaust and intake and are making maybe 50HP more than I am. Problem is they spent an extra $2k minimum for the extra parts and that doesn't include the cost of their tune and dyno pulls. In addition they just go a tune, no extra features like launch modes or transmission and fuel rail management, and transparency mode that doesn't increment the ECM write counter flash history. I'm able to pull out my laptop and load the factory tune in about 10 minutes and then load the Trifecta Tune later with another 10 minutes. Trifecta has excellent customer support and has always responded quickly when I had questions. I'm very confident when I say I made a very wise choice trusting my cars brain to Trifecta. They have more experience tuning just this car then most tuners have in total. I spent quite a few months researching tunes before deciding to try Trifecta's and being totally honest, I was sceptical about the available gains for the ATS-V. It was almost as if the price (quite a bit higher than some other options) was being justified by outlandish claims of increased HP. But after a weeks worth of driving my V post tune, I have to say I couldn't be any happier. Actually, I'm ecstatic! The tune has totally changed the characteristics in Sport and Track modes, basically turning the car into a complete beast. Throttle response is massively improved, with almost instant response to increased power and turbo boost is consistently reaching unheard of rates of 20psi. Even with traction control on, I can accelerate with WOT at around 50mph and spin up the rear, which is sooo much fun!!! Shift patterns are also greatly improved, with upshifts coming a little higher in the rev range and auto down shifting kicking in after less aggressive acceleration vs. stock. This all makes the car feel more aggressive, improves the average exhaust note and for me, makes the car far more fun to drive. The guys at Trifecta have quite obviously invested a huge amount of time and research in creating a custom tune that is optimized for the ATS-V and deserve a HUGE pat on the back for the result. By comparison, you can spend 4 or 5 times the price of this tune on hardware mods and still not see the same benefits at the pedal. I highly recommend this tune as your first option for HP gains and improved drivability. And if you want to calm things down and switch into Tour or Snow/Ice mode, stock settings are retained, so you can hand the car off to the wife and feel safe you are not handing over a missile (just kidding ladies!). As far as the install goes, personally I found it a bit more challenging than I expected. Being a Mac user, I had to first install Parallels on my laptop (this enables you to run MicroSoft Windows 10 on your Mac. There is a free 30 day trial, so no cost to get the install done) and I think this is what slowed down the install time, which was well over an hour (It would have been good for Trifecta to have made it clear there is no Mac version at the point of purchase, but that's just a small gripe). The install also kept crashing when I had my laptop only on battery power and I had to plug it in to mains power for the USB port to have enough juice to power the cable for install. And so to support...I have to say I was a little worried when the first install attempt failed at 5% and as a result my car was stuck in Park! Then when I realised there was no telephone support I was in a real panic. But major props to the Trifecta support team, as almost as soon as I hit "send" on my online support request, I received an informative, detailed diagnostic response. I spent the next hour going back and forwards with the support team until the install was completed and I even received a message before they left for the day making sure I was good to go. In conclusion, I'm delighted with the tune, extremely impressed by Trifecta's support and can't wait for further development to include support for additional hardware mods to help increase the power and performance of my V even more. Hint, hint...50/50 or 100% vent to atmosphere BOV's, more air intake systems, etc. As you will see, I have been blown away! I couldn’t be more pleased with the “bang for the buck” this upgrade provides for an ATS-V enthusiast. My ATS-V is a 2017 sedan, 6-speed manual transmission, with approximately 10,000 miles. Prior to adding the Trifecta tune, it was 100% stock. First off, let’s start with an overview of what the calibration does. 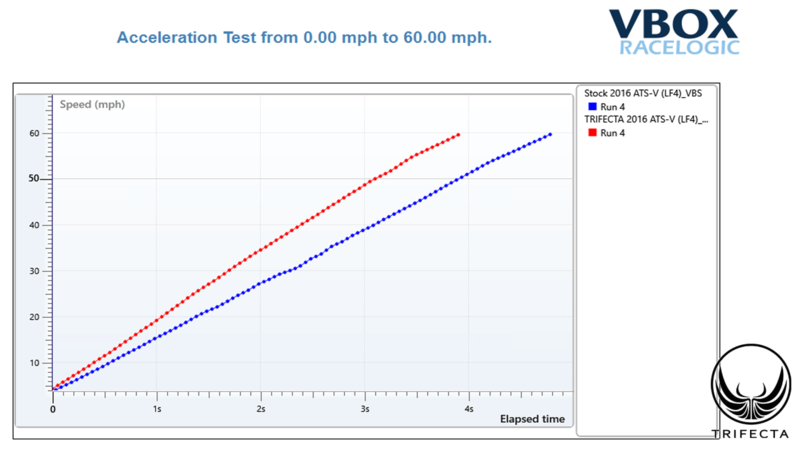 Trifecta’s website provides a very descriptive explanation of how the Trifecta tune brings the stock ATS-V’s 464hp up to the neighborhood of 600hp (around 500hp at the wheels). Although the LF4 is advertised to provide 18lbs/in2 of boost from the twin turbochargers, those that watch the digital boost gauge have likely asked the same question I did. “Am I really achieving 18psi of boost when the most I ever see on the boost gauge is 12psi?” And the answer is, “no,” and that’s because our LF4s software does not allow the boost to reach 18psi (at least mine doesn’t, as well as others I’ve talked with). The reasons for this, I do not know. The Trifecta tune brings the maximum boost output up from 12psi to 18psi, and also provides what Trifecta describes as, “active rail pressure management, bi-directional enhanced knock control and zoning, enhanced engine and transmission response,” and various other features. Their website goes into detail for each of these features. The tune is also advertised as significantly enhancing the 8-speed auto transmission’s performance; although as noted I have the 6-speed manual. Trifecta also provides what, to me, was a convincing argument as to choosing their tune over taking my car to a local dyno tuner, noting, “Why buy a tune from a dyno shop that might run your car on the rollers 10 times when you can buy from a company that's channeled over several hundred dyno pulls' worth of testing into their product? Rather than relying on a “dyno tuner” that may or may not have experience tuning the ATS-V (but almost certainly to their local area only), with TRIFECTA you can rest assured you're purchasing from the company that's been in the GM factory turbo vehicle tuning business longer than anybody else, in many cases pioneering the tuning aftermarket for these vehicles. The TRIFECTA ATS-V calibration has been subjected to over 300 chassis dyno pulls, on dynos across multiple continents, and tens of thousands of test miles have been accumulated in virtually every climate, elevation and season.” As I noted, this was a rather convincing selling point to me personally. I would never describe the stock ATS-V as being under-powered. Those of us that have read and watched the multiple reviews by the various car magazines and auto journalists have seen the incredible stock performance displayed by the ATS-V, such as zero-to-60 in 3.8 seconds (MotorTrend actually achieved 3.7 seconds), while receiving near-unanimous praise for its incredible handling, steering feel, chassis stability, strong braking performance, and track stability and traction programming modes. I have greatly enjoyed the ATS-V in its stock form, but soon decided I wanted to experiment with a little more performance. Given the inherent increased ability to tune cars with forced induction, I started by looking at performance upgrades via changes in calibration. After researching the options, the Trifecta tune appeared to be developed over considerable time with precision, by a company with a strong reputation and expertise in what they do. I asked multiple questions prior to buying, and the Trifecta team was very patient, professional and detailed in their responses (more on that in a moment). Purchasing the tune from Trifecta provides the buyer with the tune itself and the cable that connects the user’s laptop (via USB port) to the ATS-V’s OBD-II port. Their website is well-developed and convenient to use as far as inquiries. Customers can ask questions via a personalized “forum” experience, with just the customer and Trifecta Q&A. I asked multiple questions prior to purchasing, and the team at Trifecta were consistently very quick to answer my questions thoroughly and in a professional, patient, and friendly manner. 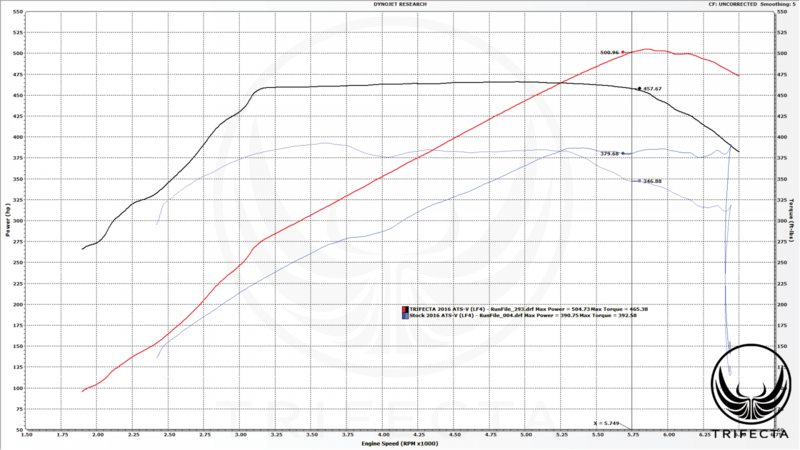 Once your calibration tune is ready, it is available for download in the customer’s forum. The customer also receives a detailed list of the types of additional modifications that are compatible with the Trifecta calibration. For example, one of my questions was whether the tune would need to be adjusted for a set of down-pipes and mid-pipes that I have on order from my friends at Weapon-X. I was pleased to see that the stock tune is 100% compatible with downpipes, with cats or cat-less. Installation was conducted using Trifecta’s step-by-step installation guide, which also includes a video of the process. Installation was completed without a hitch, and took about 15 minutes from start to finish. Couldn’t be easier! - I’m very impressed with the increased power! This car is now incredibly fast; night and day versus stock! from about 1,500rpm all the way through to redline. overall integrated package” of performance (I hope that makes some sense!). to where turbo lag has been further minimized. Trifecta powered ATS-V, it’s easily managed based on how much gas you give it. Again, just use reasonable judgment. one think this is what the ATS-V was designed for. -	All stock functionality continues to work perfectly. The Trifecta tune does not impact tour mode, but is present in sport and track settings. anywhere from 12 degrees to 25 degrees here over the past few days. My stock Pilot Super Sports stay very hard in this temperature and, needless to say, the pavement is extremely cold. Not surprisingly in these conditions, traction is a challenge. 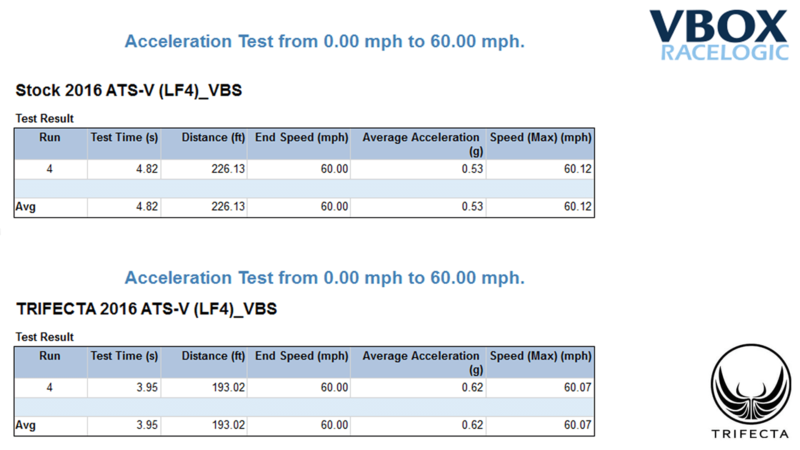 I was able to get some decent launches by modulating the throttle less than what I would in warmer, stickier conditions. I can’t wait till we get back to good weather when the Pilot Super Sports are sticky and the roads are hot. I imagine the traction challenges will be more manageable then. Overall, I couldn’t be more pleased! Bang-for-the-buck, I’m convinced this is an awesome upgrade! As mentioned above, I have some down-pipes and mid-pipes ordered from Weapon-X, and can’t wait to see what this beast is like once I combine those with the Trifecta tune! Thanks again to the team at Trifecta for a great product! If you own an A8 this calibration is worth it for the transmission programming alone. It has turned my 8L90 into a hyper-aggressive monster and I absolutely love it! The car certainly feels noticeably faster at WOT as well. So, I had this tune installed on a client's car for about 5 days now, and all I can say is that this tune is INCREDIBLE. The car is a 2016 ATS-V, M6, bone stock other than the tune. The car feels much more responsive and "alive". Boost comes in quicker than stock, so you almost don't feel any turbo lag at all. In my experiences, doing easy launches in first gear, the power can be put to the ground very well on the stock PSS's. I have yet to see any fuel economy differences when driving like a normal person. Normal drive-ability is not degraded at all...if anything it is improved. It's nice to be able to go in to Touring mode and have stock drive-ability and the nice soft road manners for a highway cruise. I can tell you that Steve at Trifecta definitely put me at ease and spent much more time than expected talking to me on the side, explaining the intricacies of how this tune works, and teaching me a thing or two. I was very impressed with how open he was to talk and explain everything so well...you can tell the pride that he puts in to his work. Overall, both myself and my client love the tune, and don't have anything to say negative about it at this time. Assuming I can edit this review, I'll post up my experiences after both myself, and my client, have more time to put miles on the car. Feel free to reach out to me on Facebook and I'll be more than happy to provide any feedback that I can. I purchased the tune on Black Friday but had to wait about 2 weeks for my cable to arrive due to weather related issues with the Post Office. I have been busy so I was not in a hurry. Three weeks after my purchase I downloaded the tuning file and the tune without incident. A week later I prepared to program the car and began to do so. It took me seven tries to get the tune download to complete. I found out later from Trifecta that your computer battery charger should be plugged in while tuning. I did not remember reading this in any of the information and learned this the hard way. I started the car and it started immediately with no issue and I took it for a test drive. The temperature was 27 degrees so the car took awhile to warm up. A couple of full throttle runs and I was making 18 lbs of boost in sport mode. The next day I took the car out on a country road and let her rip both in sport and track mode. The engine pulls very hard and the acceleration is very brisk. I have owned a lot of muscle cars over the years but nothing has accelerated like this with the Trifecta tune. I love the automatic transmission shifts, the responsive throttle even in light cruising and the overall tuning of the engine and transmission combination. Trifecta has done a great job on the tune for this car. I highly recommend the tune if you are interested in having a car that is very fast and enjoyable to drive. I have a car that is truly fast enough for me. Great job Trifecta - from a happy customer!!!! !